HISTORY: MEXICANA founded in 1921 as CIA. MEXICANA DE AVIATION S.A. Was Mexico's oldest airline and one of the oldest continuously single-branded airlines (after KLM, Avianca and QANTAS), and Mexico's biggest and flagship airline before ceasing operations on August 28, 2010. In February 1929, Juan Trippe of Pan Am took over the majority of the airline's stock, and the company opened its first international route, with service to the United States. 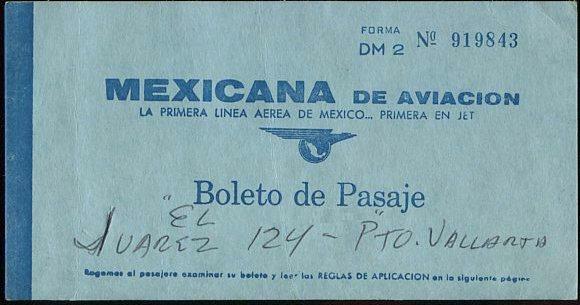 Mexicana used the Ford Trimotor plane to operate the Mexico City-Tuxpan-Tampico-Brownsville, Texas, USA, route. Charles Lindbergh piloted the first flight on this route. In the 1959 Mexican State acquires PanAm's stake in Mexicana and Aeromexico.